The O.C.D. Chief? I bet those are some clean, well-locked offices. OCD? So he must be on Prozac? just a joke! 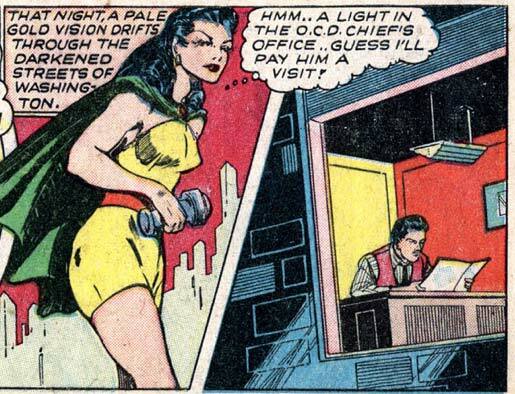 What is that in Phantom Lady’s hand? That’s her blackout flashlight. She doesn’t have any actual powers per se, just the flashlight that blacks out the light wherever she points it. The inspiration for the Silk Spectre perhaps? Interesting thought, it definitely could be. The yellow jumpsuit definitely fits. If I was wearing those colors together, I’d want to black everything out so nobody could see me, either. But…does she see in the dark, like Dr Mid-nite, or is she herself blind when she uses her blackout light?